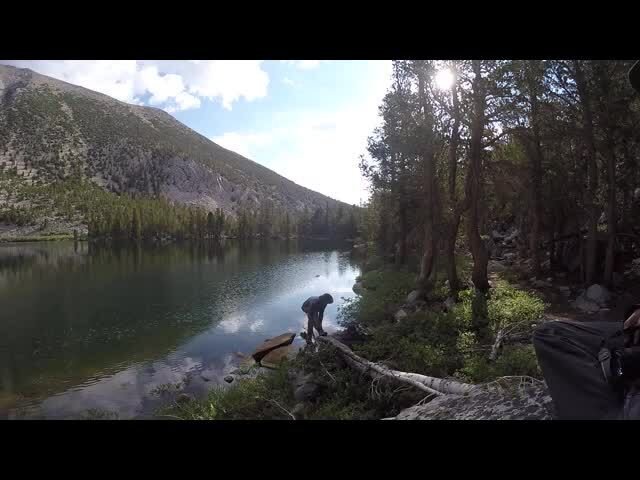 Day 5: We hiked from Seventh Lake to Fourth Lake, then headed northeast in order to visit Black Lake before descending on the main trail to our car. This was our final day in the wilderness. We woke up at first light and began the morning rituals. I ate a pop-tart while the boys cooked and ate everything they could find in their bear cans. Even the dogs ate the last of their food. 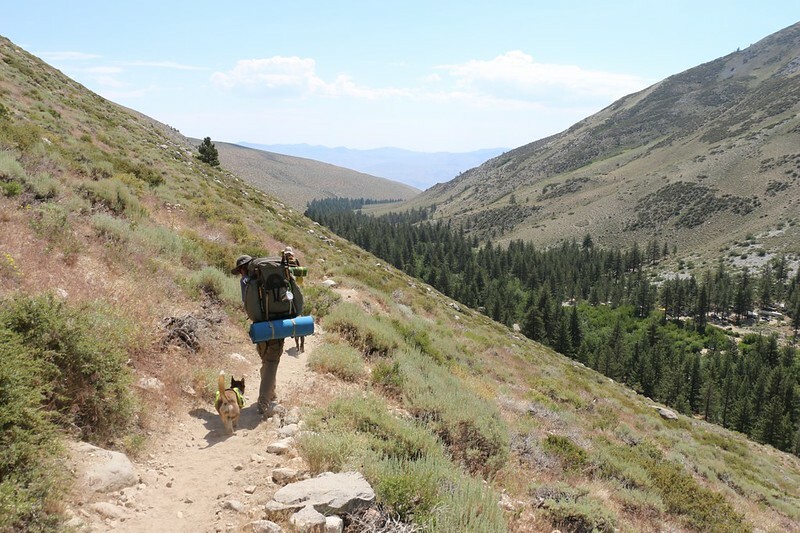 Then we packed up all of our gear and got ready to hike back out to civilization. We would have loved to stay longer up here in this area, but life has its pressures and responsibilities, so back to work we would go. Tomorrow morning we’d be toiling away, sadly enough. But meanwhile, we had a lot of traveling to do today! We began hiking at 7am. We said good-bye to Seventh Lake and headed off cross-country toward Sixth Lake, where we would pick up the main trail once again. 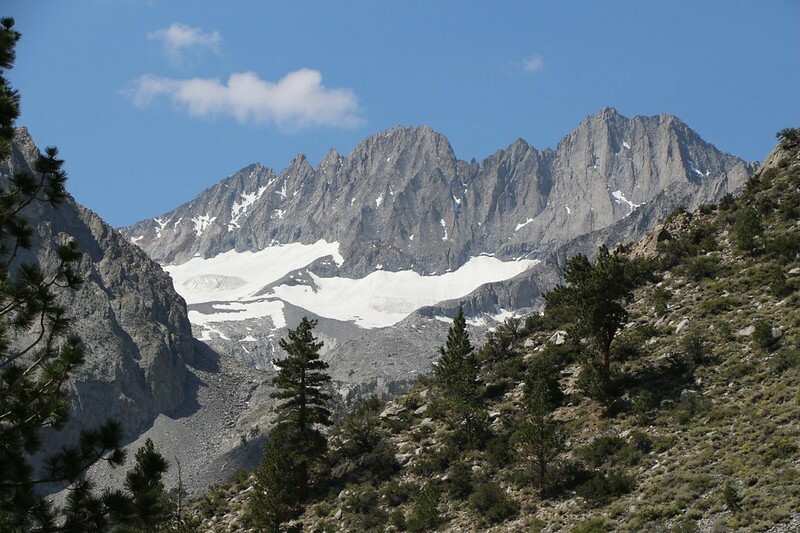 Along the way, we enjoyed the views south toward the Sierra Crest and the Palisade Glacier. It was a beautiful morning to be hiking. We were tempted to take another side trip to revisit Summit Lake, but we really didn’t have enough time. 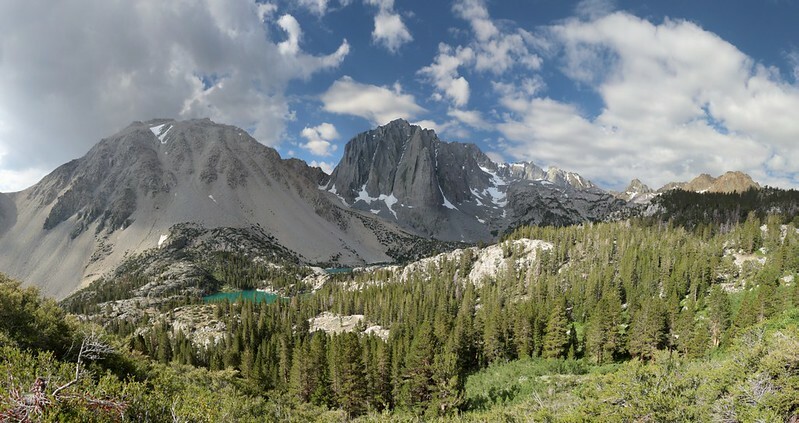 Our plan for today was to head left on the unmarked trail that circled Fourth Lake on the north and east sides, then take another left toward Black Lake on the upper trail. Eventually we would re-join the main trail just below First Lake, thus making a bit of a loop out of our trek, with the added benefit of seeing yet another beautiful lake. We were immediately rewarded for our choice of trails. The views from the north shore of Fourth Lake were stunning! 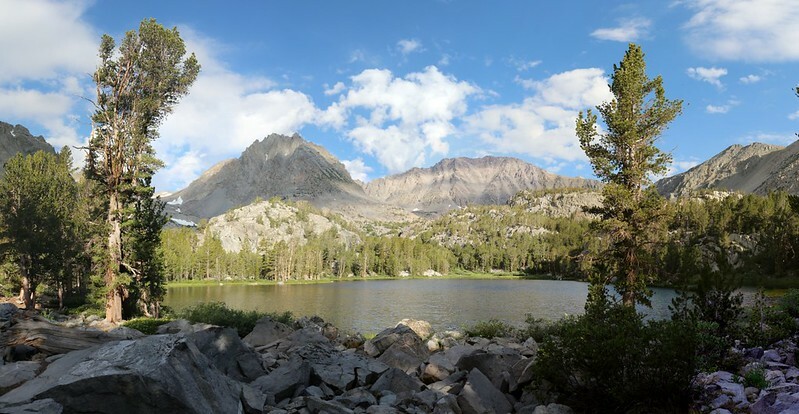 The trail (and several campsites) was located along the top of a line of granite cliffs that bordered the lake, giving an unobstructed view of the Sierra Crest. 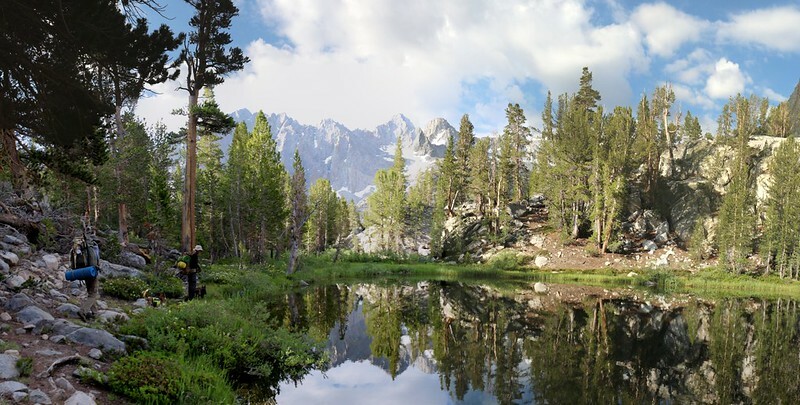 I decided that if I ever make it back to the North Fork of Big Pine Creek that I would be sure to camp at the north shore of Fourth Lake. It was that good. 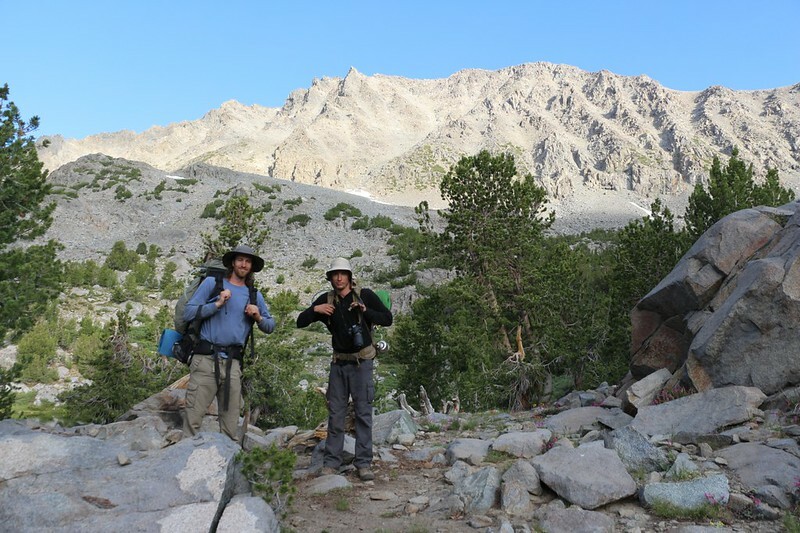 It was also in the center of the basin, so if you set up a base camp here, you could day-hike anywhere else with ease. And when you came back to camp, you could eat dinner with that gorgeous view. 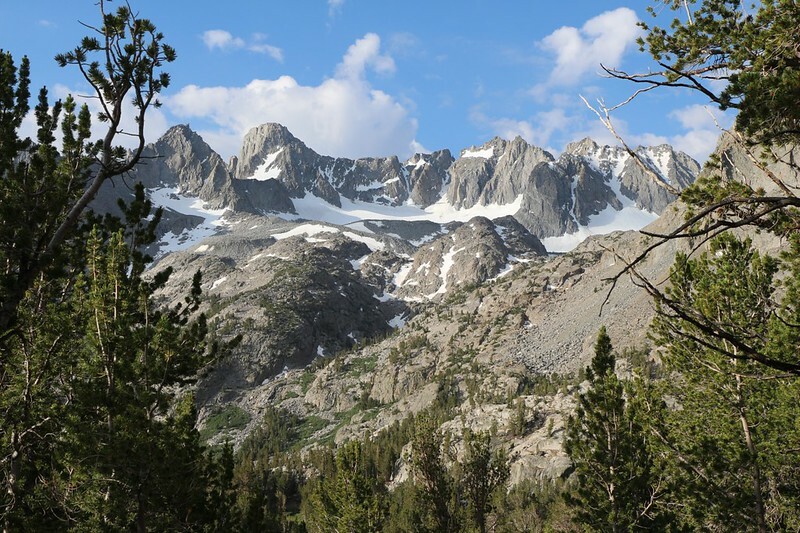 I imagined sipping my morning coffee, with my breath fogging lightly in the chill air of dawn, as the alpenglow lit the distant granite of Thunderbolt Peak. Heavenly! 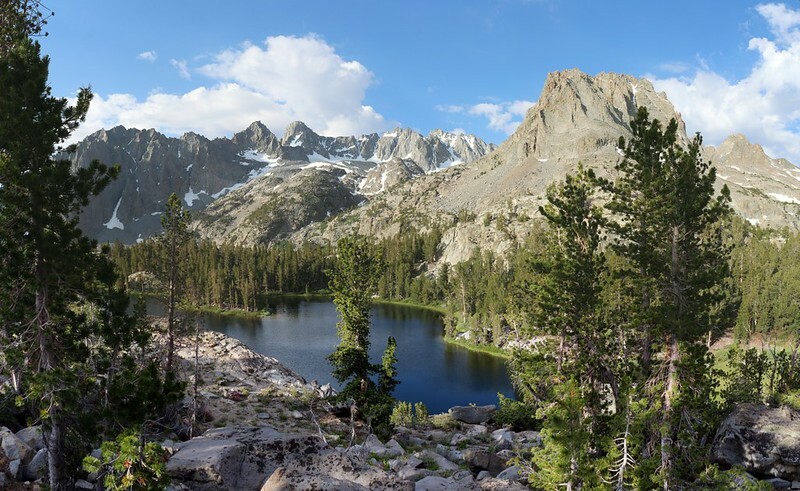 We continued around the shore of Fourth Lake until the trail intersected the upper trail to Black Lake. It didn’t take long, only a half mile or so, to reach the lake. We stopped for a short break and watched the trout swimming near the shore. There were even a few mosquitoes there, which was unusual on this trip, so we didn’t stay to get eaten. This was the final lake that we were going to visit this trip. 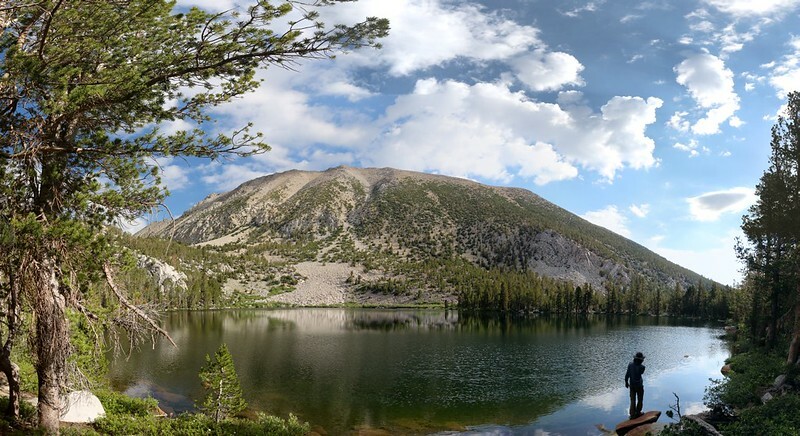 We’d seen every lake in the basin except one, Sam Mack Lake, which was high above Sam Mack Meadow at 11,800 feet elevation. Maybe next time we’d check that one out. 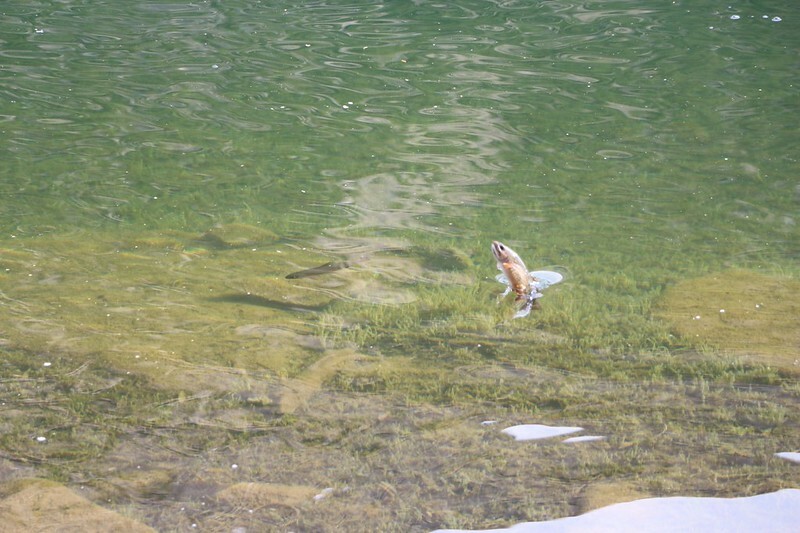 I couldn’t believe it but I lucked out and caught a trout jumping out of the water! 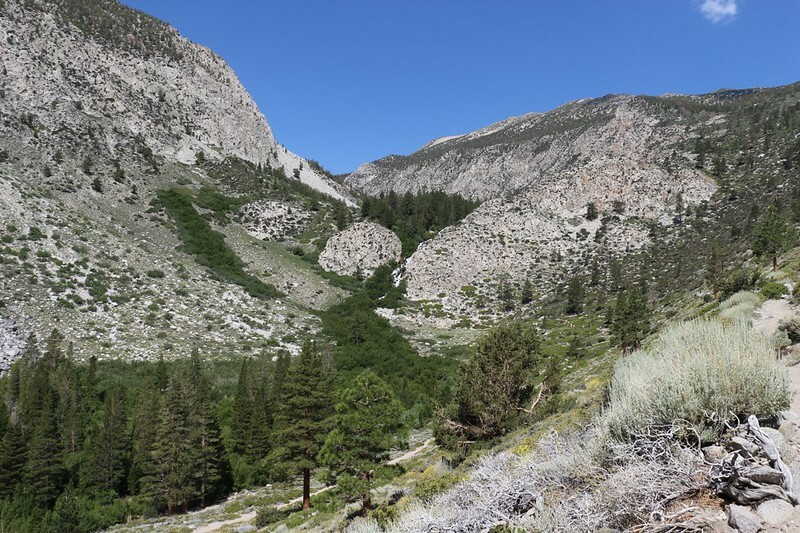 After Black Lake, the upper trail continued on a continuous, steady descent toward the main trail and Big Pine Creek. Along the way it stayed high above the valley floor and provided some great views down over First and Second Lakes. We took one last look at Cloudripper behind us, and Temple Crag across the way, then headed on down the long sunny switchbacks. We met up with the main trail and continued hiking downhill. It was a fast hike, as you might expect. 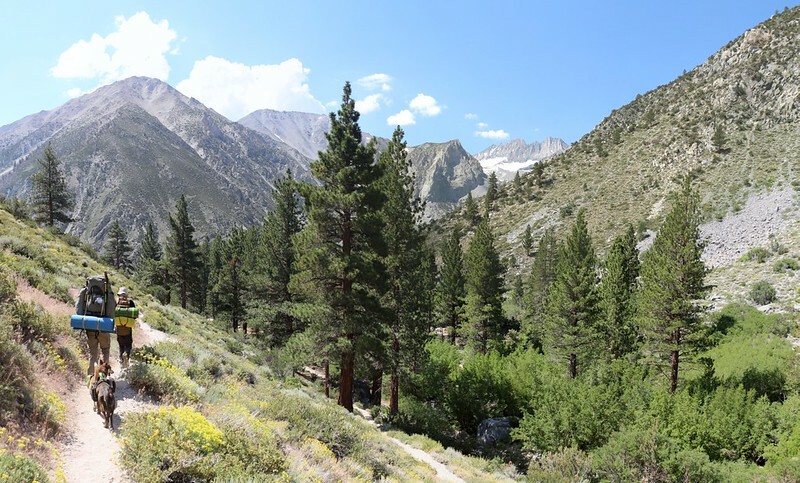 But just the same, we had four miles further to the trailhead, so we stopped once along the way at the old stone Ranger Station, where I took off my shoes and cooled my feet in the creek. After that, before we knew it we were descending below Second Falls. We each had long legs and they were helping us make some serious time! 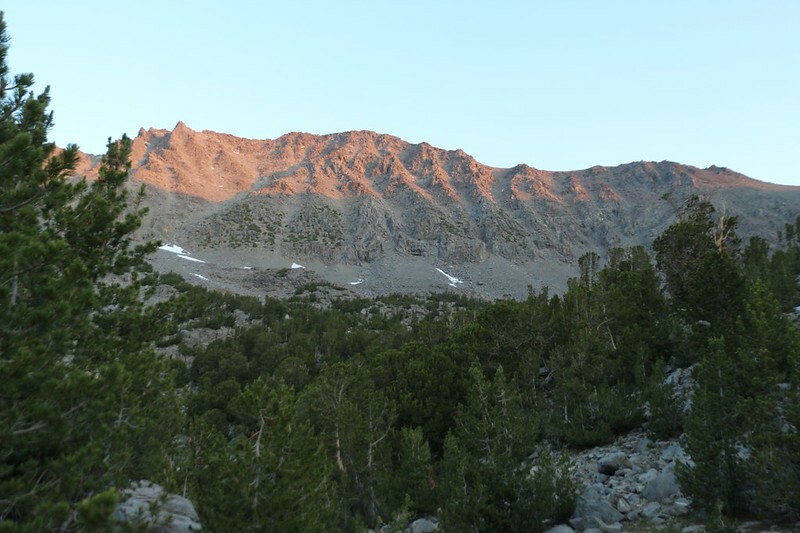 We passed our first night’s campsite at the Walk-In Campground at the top of First Falls and checked out the far mountains to the right, high up in the South Fork, namely Clyde Peak and Middle Palisade. Maybe we’d head up that way on some other trip, some other year. 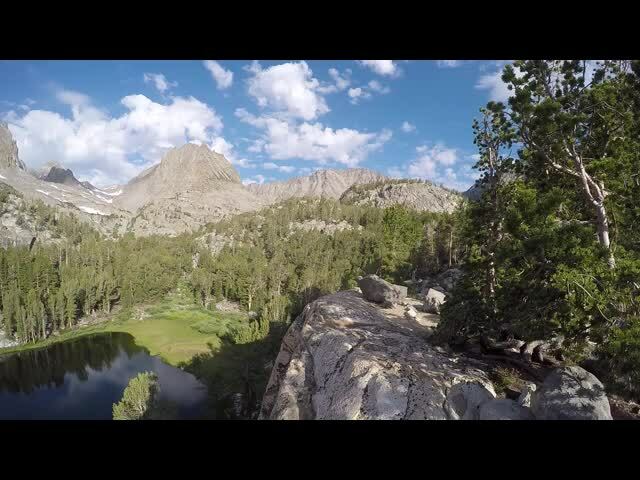 There were so many things to see in the Sierra, and we had so little time. It started getting seriously hot on the final stretch of trail to the car. There were almost no trees, so we hiked in the sun and roasted. We sprayed the dogs with water (as they were wearing fur coats), but we weren’t sure if it really did anything. So we hiked even faster. We ended up getting back to the car by 11am, which surprised us completely. It had only taken us four hours to hike 7.5 miles (including rests). That downhill hiking sure is fast! We started up the car and turned the air conditioning on full blast. 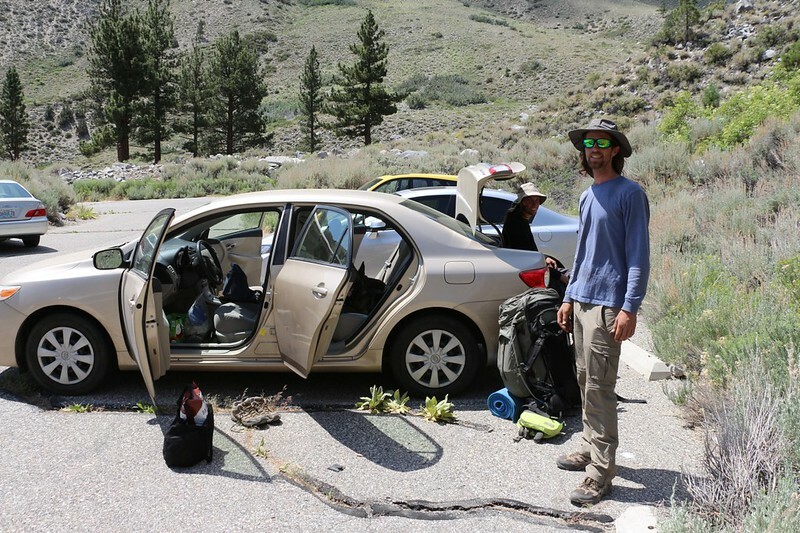 We stuck the dogs in the car to cool off while we busied ourselves with our gear. We changed into fresher clothing and I put on a different pair of shoes. We felt like new men, and we were already looking forward to buying lunch at a restaurant down in town. And that’s exactly what we did, but not the way we’d hoped. We had to get the food “to go” as they wouldn’t let the dogs inside. And it was far too hot to sit outside at a table, well over 100 degrees. It was temperatures like that which made us wish we were still high in the cool mountains. But we’d take the car’s air conditioning as an alternative. So we ate as we drove, and watched the miles fly by. On the way back to San Diego, we talked about the trip. What worked and what didn’t. It turned out that nothing “didn’t” work, as we hadn’t had any problems at all. We came to the conclusion that pretty much everything worked. We had plenty of food, the weather was great, the dogs were (mostly) well-behaved, and we were strong enough hikers to get where we wanted to go. Best of all, the scenery was absolutely spectacular throughout. 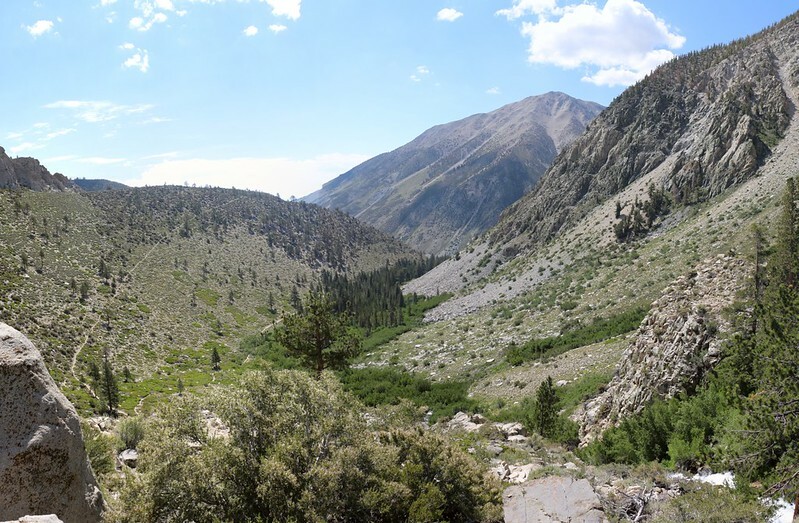 The North Fork of Big Pine Creek was now on my short list of top spots in the Sierra Nevada. I have a strong feeling that I’ll be back here again one day. And it won’t be too soon!